Motorcycle chain and wheel work made easy. The perfect tool for: Tire and Wheel Cleaning, Chain or Belt Maintenance, Valve Stem Positioning, and Tire Inspection. • Accommodates bikes up to 950 lbs. • Accommodates bikes up to 650 lbs. Bill, received the Wheel Jockey order all AOK! Great service and clever well executed product…to say it works well is understatement! Thanx! AWESOME, AWESOME, AWESOME! THIS IS EXACTLY! WHAT I NEEDED. Works perfect for the front wheel of my Goldwing. Absolutely the BEST and EASIEST way to clean the wheel! Thank you again. It was worth the wait. Mate I am absolutely stoked with the wheel jockey. It works an absolute treat. The rims on my zx14 have never been so polished. I will certainly recommend it to my mates. Not sure what went wrong with the delivery. The only thing I can think of is that you used shipping/email details from Paypal, which I set up years ago when I lived at a different address. Not sure but anyway good job tracking me down. I appreciate it. Your product is a ripper. My wife is always looking for the perfect gift, as she puts it “for the man who has everything” and she found it! I ride a 2009 Victory Vision with no center stand. It is always a pain to check the air in the tires (which I do before every ride) and keep the wheels looking clean. I am happy to say that the Wheel Jockey changed all that as I simply roll my bike onto and can turn my wheels with ease to remove the chore out of cleaning and checking my air! I just wish you hadn’t waited so long to come up with the larger model to support large touring bikes but it was worth the wait. Thank you so much for building such a fine product that makes my life easier!! Hey Bill, I cannot tell you how much the Wheel Jockey has impressed me. It made cleaning the front wheel of my Wing so much less of pain in so many ways. The more I use it the more I love it. Thanks again, like I said before, it was well worth the wait. Bill, I finally had an opportunity to use the Heavy Duty Wheel Jockey this past weekend to lube the bike chain. Sure does beat spray-then-push, spray-then-push. I have a 2003 Kawasaki ZZR1200 that weighs a little more than 600 lbs and turning the rear wheel on the wheel jockey was no effort. At 65, I no longer have the strength to pull the bike up on the center stand; even the husky guys at the shop have a hard time doing it. Your invention is certainly a very welcome tool. Thanks so much and good fortune to you. Hey Bill, I ride a ZX-636. I don’t need a friend to hold my bike on the side-jack for lubricating the chain anymore… :)) Great stuff you got there. Got the Wheel Jockey yesterday. I knew it was going to be small but hadn’t realized how small. It certainly makes cleaning the rear tire easier, it still isn’t any fun but at least now it is easier. So, wow thanks for the incredibly quick delivery. My motorcycle magazine subscriptions take weeks to get through and your product showed up promptly. Found it on the front step when I got home tonight, moved the wife’s car out of the way and gave it a try. Got it on the Wheel Jockey first time, cleaned the rear wheel to try it out– having lubed the chain three days ago. I think this is going to work out just fine. Thanks again. Thanks for advertising on Facebook and reminding me about your product. I saw your ad in CycleWorld (I’ve been a subscriber for a long time) but now I’ve seen your ad while I’m sitting at my computer, and will email a friend about the Wheel Jockey. I have center stands on all my bikes, but my friend has a bike without one, so I might be doing him a huge favor. Your product will make it so much easier to lube his chain, he’ll save it’s cost in no time! Chains are expensive. to clean the rear wheel. No need to have a race stand, no asking friends to tip the bike over, just a simple efficient one man job. 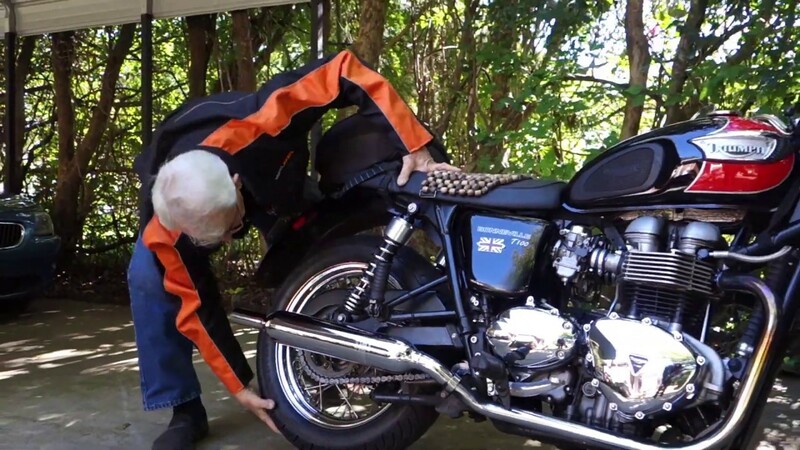 Wheel Jockey comes from the mind of a lifetime motorcyclist and that’s why it’s so simple and effective. I just wish I’d thought of it. opinion? The Wheel Jockey is a MUST for any chain driven street bike owner out there, be it a chopper, a custom, a naked or a sports bike. Even if it’s not chain driven, it will help you clean the rims. Try it once and you’ll never do without one again! I’ve got to take my hat off to you. I immediately tried out the Wheel Jockey and it works exactly as advertised. You saw the pictures of my Hayabusa and the trailer that I pull when my wife and I travel. Well just try and picture what I have been doing every summer when traveling and we get to a motel at night and I start to lube my chain. With the trailer hooked up to the Hayabusa and me trying to push the bike a foot and then spray lube and then push another foot and spray lube, I am 20 minutes and half way around the motel parking lot. Now with the Wheel Jockey I am going to be 2 minutes and already parked in my spot. This product is absolutely one of the greatest accessories for a motorcyclist that owns a bike without a center stand. AAAAAA to the Wheel Jockey. I used it this morning after a great ride; worked a treat. I am very pleased. Now I want a second one to keep at my holiday house! I will be recommending to others. Will motorcycle cleaners cause harm to the Wheel jockey? NO…the Wheel Jockey has a powder-coated finish and will withstand most any cleaning agent. The bearings in the rollers are sealed and should also not be affected by cleaners. If, for some reason, strong solvents are used, it is possible that the rubber backing could come loose. In the event that should happen, you may contact us for a replacement. Can I use it on my front wheel? YES…all three Wheel Jockey models may be used on the front wheel of most any bike. However it must be done carefully. It’s important to keep the front fork against the left stop to prevent the wheel from“flopping” back and forth while working on it—which it will do if pointed straight ahead. can be placed behind the front wheel about 6-8 inches so that when the bike is pulled up on the centerstand, the front wheel lands on the Wheel Jockey in the same motion. Can I use it on my Gold Wing? YES…Big Joc Wheel Jockey can be used on the rear wheel of a Gold Wing if necessary. Just follow the instructions in the “Instruction Sheet”. Since most Gold Wings have center stands, it should not be necessary. Using the WJ on the Front wheel is covered in Q #1. Can I use it on a Trike? YES…the information we have received from our Trike customers is that the Wheel Jockey Big Joc can be used quite easily on the rear wheels in the same way one would use it for a standard bike. However, if the Trike has limited-slip rear end, which some apparently do, it is less likely to work unless two Wheel Jockeys are used at the same time. YES… all threeWheel Jockey models may be used on the front wheel of most any bike. However it must be done carefully. It’s important to keep the front fork against the left stop to prevent the wheel from “flopping” back and forth while working on it—which it will do if pointed straight ahead. If the bike has no centerstand, we have found it best to pull the bike backwards up onto the Wheel Jockey, keeping the solid “step” pointed towards the front tire. If the bike has a center stand, it can be placed behind the front wheel about 6-8 inches so that when the bike is pulled up on the centerstand, the front wheel lands on the Wheel Jockey in the same motion.